Kate leads the next generation of financial advisors at Kooman & Associates. As a shareholder of the practice, she continues the proud tradition started by her father, Marty Kooman, more than 25 years ago. Kate shares her father's belief that trust is the foundation of each successful client relationship, and is the driving force behind our enduring efforts to better serve our clients and those they care about most. As a financial advisor, Kate works in a collaborative fashion, striving to make each client feel comfortable and give them the personalized attention they deserve. She is committed to enhancing all aspects of the financial decision-making process as she guides the families, small businesses and independent women we serve through life's financial challenges. 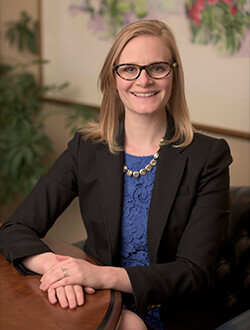 Before joining our team, Kate honed her managerial expertise as an associate director at The Advisory Board Company in Washington, D.C., a healthcare consulting firm where she worked for eight years. She graduated from Franklin & Marshall College with a bachelor's degree in neuroscience. Kate is a Certified Financial Planner™ professional, holds the Series 7 and 66 licenses as well as the health and life insurance license. Kate lives in Hollidaysburg with her husband, Jeff, and is actively involved in the community. She is currently a board member of the Hollidaysburg YMCA, the Central PA Regional Young Life Board, serves on the Blair County Chamber of Commerce WE-LEaD committee, as well as the United Way grant reviewing committee. Kate is a 2017 graduate of Leadership Blair County through the Blair County Chamber of Commerce.